Drive 10 minutes north of Naramata along the lake and you've arrived. The very last house on Indian Rock Road and it's worth the drive. 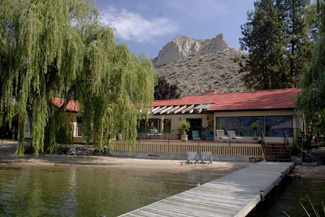 Sprawling mediterranean-style rancher on 1/3 acre shares this small bay on Okanagan Lake with just one neighbor. Beautiful sandy beach, super private, super quiet. The house takes full advantage of being on the lake with all the living areas opening onto the beach-side deck. Featuring four bedrooms and a big games room, it is designed for all seasons. Lots of deck and open doors in the summer, 15-foot stone fireplace for the winter. European tile and hardwood floors. Cabin/studio has a perfect yoga/workout room below. 147-foot sandy beach, 80-foot dock. The best part? Recreational boaters seldom venture this far from Penticton or Peachland - solitude is actually a reality.